Somebody just had a bird-bath: As for me, I'm knitting bacon. That photo cracked me up! Looks like somebody really enjoys bath time. June 11, 2011 at 7:47 p.m.
i just shouted out loud from this cuteness! June 11, 2011 at 8:11 p.m.
We have the same cockateil as this!! He loves to be sprayed and hangs upside down with his wings spread! 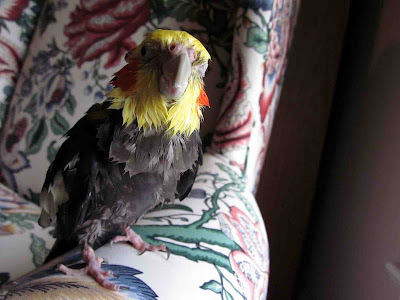 I'd really like to know what kind of bath your birdie uses, I may be able to coax ours into a different way of bathing but he's 31 years old now so he may not want to change! June 11, 2011 at 8:30 p.m.
June 11, 2011 at 8:52 p.m.
lol! I love that bird! Please post more pictures! June 11, 2011 at 8:53 p.m.
Kate - thank you! Pookie says thank you as well! See, I always figured that bird pictures fell into the same category as cat pictures - only adorable to the people who took them and boring detritus to everyone else online. June 11, 2011 at 8:56 p.m.
June 12, 2011 at 3:11 a.m. Yes, please, more birdie beefcake! I thought this one was so cute that I saved it (please do assure Pookie that I'm not stalking him, I'm just an avian fan). Not only have I always enjoyed eating bacon, but we are in the process of buying a home on Bacon St. so, needless to say, I'm looking forward to the bacon mittens. June 13, 2011 at 11:11 p.m.
June 14, 2011 at 9:37 p.m.